Headboard measurements can be based on many factors, including the room size, your decorating scheme, the style of bed and bedding, and, of course, the size of the bed. While there are some basic guidelines for choosing headboard dimensions, these may merely be your starting point. From there, you can go taller, shorter, wider, or anywhere else your ideas take you. Just keep in mind that if the headboard will mount to your bed frame, the mounting holes for both parts must line up. There are no precise standards for headboard width, but many "standard-size" headboards fall between 0 and 3 inches wider than the bed's mattress or frame. Headboard widths within this range usually apply to the four basic mattress sizes: twin, double, queen, and king. The chart below shows typical dimensions for these and other common mattress sizes. 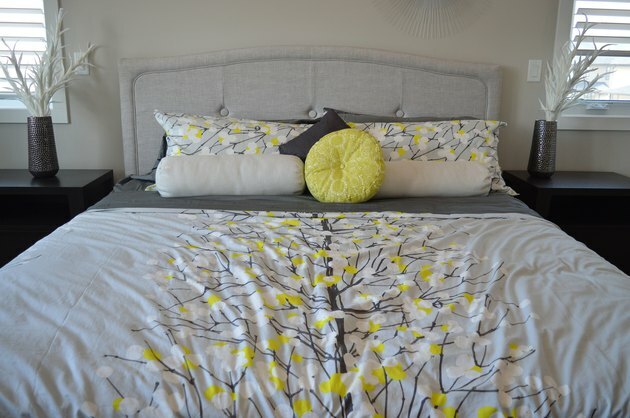 As a decorating element, a headboard that is standard width has a proportional relationship with the bed, while an extra-wide headboard can become a dominant feature of the wall and can even incorporate bedside tables, bookshelves, or other furniture pieces, often giving the headboard a built-in look. If there's a standard headboard height, it's around 48 inches, but there seem to be as many exceptions to this rule as there are adherents. Keep in mind that the effective height of a headboard is the amount you see above the mattress, rather than the total height from the floor. When mounted, the bottom of the headboard is typically about 3 to 4 inches below the top of the mattress. As a general rule, the bottom edge of the headboard should be hidden behind the mattress, unless you're going for an obvious "picture frame" effect, where the headboard is mounted to the wall several inches above the bed. Another decorating rule (based solely on preference) is to choose a headboard to suit your bedding and pillow arrangement. After all, you see the headboard most often when the bed is made up. Consider how much headboard you'd like to see exposed behind the pillows. For a traditional plump-pillow look, a 42- to 48-inch-tall headboard will leave several inches of headboard above the pillows (remember that 3 inches, or so, will be lost behind the top of the mattress). If you'd like to see more headboard exposed, look for a 52-inch or taller headboard. Alternatively, if you're going for a low, horizontal modern look, the headboard might be much lower, perhaps 20 to 24 inches above the top of the mattress. 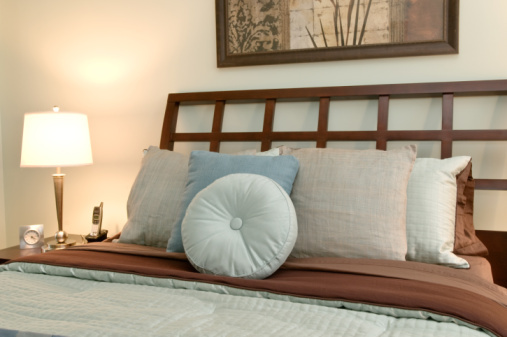 Headboards are typically mounted to a bed frame or to the wall. Basic metal bed frames usually have brackets at the "head" ends of the mattress rails for securing the headboard. 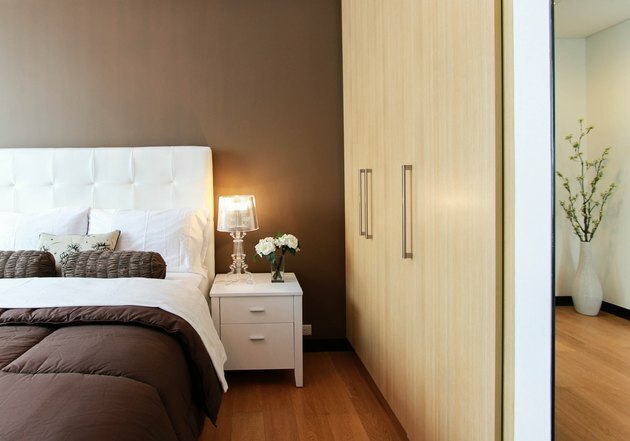 The brackets have elongated screw holes to accommodate slight variations in headboard width. If your headboard is too wide to fit these holes, you can buy adapter brackets that give you a few more inches of play. Mounting a headboard to the wall means you don't have to secure it to the bed and therefore aren't limited to the width of the bed frame. Some wall-mounted headboards stand on the floor and have a mounting system for anchoring them to the wall. Others simply hang from the wall via a French cleat or other type of heavy-duty hanger system.